In a region crowded with energy companies, Continental found that they were falling behind their competitors in attracting qualified job seekers and decided that they needed an updated digital presence to improve their image, boost their visibility, and help grow the company. Marker Seven created a site that took Continental from the worst to the best in their industry and showcases them as an innovative Fortune 1000 company. Highly customized, it supports administrative processes while meeting their priorities of attracting top talent and investors. 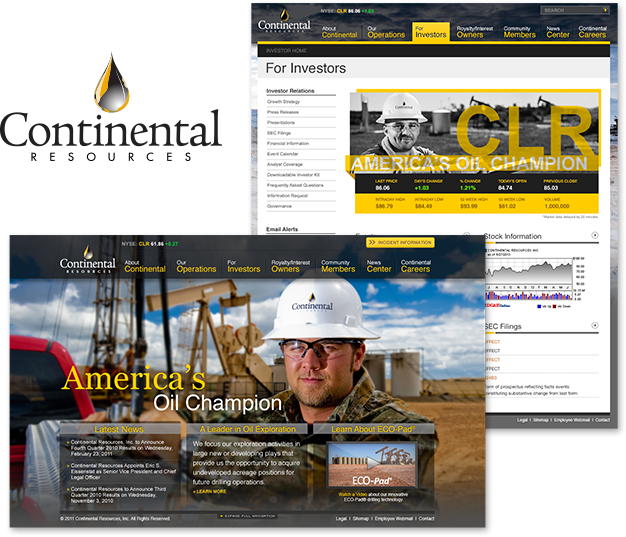 A long-time leader in the energy exploration industry, Continental had historically given little thought to its website. The existing site design projected a start-up operation rather than a well-established, $2.6B publicly-traded company with1200 employees. We quickly flew out to meet with the team and immerse ourselves in the oil business and OKC culture. After embedding our team with theirs, our mission quickly became clear: accurately portray Continential as a profitable, thriving company in order to jump-start investment, job recruitment, and community outreach. More than simply rebuilding a website, we needed to reimagine their digital image and external communications efforts. Our content strategy identified the critical communication points for investors and landowners, the local community and potential employees. They included showing detailed information about operations and technologies used, providing transparency into how royalties work, and showcasing good works within the community. We recommended video and created interactive media for differentiating features such as ECO-Pad, a proprietary system that allows multiple wells to be drilled into a single pad. To help keep the content relevant and up-to-date we integrated several third-party applications, including Thomson Reuters for investors and Jobvite for prospective employees, seamlessly branding and theming them to match the rest of the site. With little more than a logo to work with, we needed to develop the digital brand. On an early call, one of the VPs said that if it were up to him, he’d make the site look like oil. Using the black and gold colors of the logo, our design team created a look that is bold and confident – just like the company itself. In a sector flooded with a glut of clinically white sites mired in oil derrick imagery, Continental stands out. Leveraging gorgeous in-the-field photography of real employees in hard hats the site projects an authentic and distinctive statement. The new site won awards and received national attention, giving Continental exactly the PR boost they were looking for. The new site needed to allow for quick and easy changes with minimal developer help. We implemented a Drupal CMS that allows the client to easily turn on and off blocks, rearrange modules or add and remove sections, greatly increasing their level of control. Several permission levels were established to give the manager of the site visibility into changes being made by marketing, administrative, and technical teams. By streamlining the financial reporting, recruiting, PR and help processes, an enormous amount of time was saved for all departments as well as enabling internal groups to accomplish their business goals like hiring key talent and attracting important partnerships. Continental took a very hands-on approach to the project, visiting our offices just as often as we’d visited theirs. Our dedicated project manager walked them through a plan that outlined the project requirements, how long each phase would take, and what its value was. We started with a research process that included stakeholder interviews, persona development and mental models. It revealed eight distinct audiences, each with widely varying needs. We demonstrated how primary and secondary audiences would interact with the site top get what they needed through use cases and wireframes. A new workflow for Continental, they appreciated the transparency of seeing how each stage of work is built on the one before. Even more importantly, they were learning things about their company that they could act on in other ways.